Robin Williams' suicide came as a shock to cinemaniacs all over the world. The man brought us joy and laughter for more than 30 years, and starred in some 60 movies. While his antics were typically physical and lighthearted in nature, as in Jumanji and The Birdcage, he also played in many darker and serious films, like Dead Poets Society and The Fisher King. The World's Greatest Dad is perhaps the only film which combines both worlds, into a terribly dark and outrageously funny film. It was written and directed by the brilliant Bobcat Goldthwait, and if you've seen his next film God Bless America, you've got an idea about just how dark the humor can get. 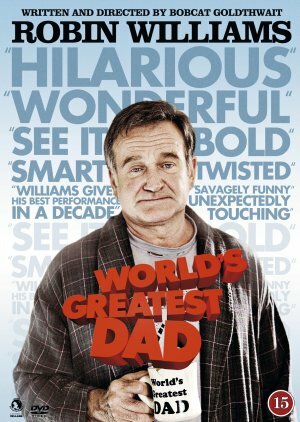 The fact that The World's Greatest Dad is a comedy about suicide, means that it won't be everybody's cup of tea, and many reviews on IMDB note that this is way too dark to for their personal taste. But the darker the funnier, I say, and I was wiping tears of laughter throughout the moive. After all, Robin Williams starred in this film because he thought it was one of the funniest things he'd ever read, and if he left us with anything, it is reminding us to laugh, especially about the things nobody else sees the humor in.